I only recently came across the 1913 James catalogue featured on this page. It’s notoriously difficult to date most bicycles and identify the actual model. Many manufacturers didn’t stamp the frame numbers in a logical progression; in addition, bikes were sometimes bought in from other manufacturers and re-badged. Records of most companies’ frame numbers were subsequently lost. And of the various models available in any one year, customers could specify any number of extras and variations – which often blurred the distinction between models. I have a strong interest in Mercury cycles. So when I saw that James’s low-price model was named ‘Mercury’ – and realized that it looks very similar to this one – I decided that mine could well be a James Mercury No. 29. without the full chain-case illustrated in the catalogue. (The Gents models have no chain-case). With such difficulties in precise identification, I’ve noticed a tendency among some vintage cycle enthusiasts and owners to identify or badge their bikes according to the ‘best information available.’ A museum set-up like this has an obligation to be more open about such attributes. So let’s say this bike serves to illustrate what the James Mercury would look like in the flesh. The James crank is distinctive. James started out as a bicycle firm in Birmingham, founded by Harry James in 1880, moving to larger premises in 1890 and going public in 1897. Like many of the bicycle manufacturers of the day, they experimented with motorized versions and by 1902 were building motorcycles. The James model 6 (picture below from internet), would have been contemporary with this bicycle. Much James advertising was aimed at female riders. 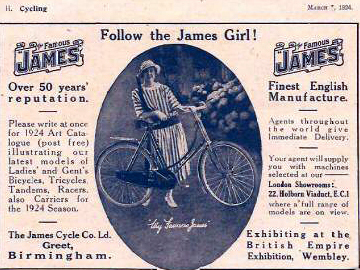 The holiday ad below suggests ‘James riders are always assured of a really good time.’ Remember that individual transport for women was a comparatively recent concept at this time (and in 1914 bicycles were still not cheap enough to be affordable by the masses). The city of Birmingham is rightly proud of its transport heritage. I’ve owned many models manufactured in that city, and I enjoy browsing the excellent website http://madeinbirmingham.org which has compiled histories of many of the marques. Obviously, most of the more successful companies moved into motorcycle production, so the focus of their histories usually relates to motorized transport, with only passing mention of bicycle production. Nevertheless, as histories of bicycle manufacturers are not always available, I’ll include the company history in full. The James factory in Sampson Road North, where motorcycles were first produced. The James Cycle Company, as it names suggests, was originally a cycle manufacturer and was founded around 1883 – 1884 by Harold James (sometimes known as Henry James). Some authors show James as starting in 1870 but this is incorrect. (I thank Birmingham author Ray Shill for his research). 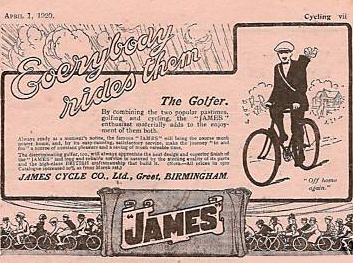 James were one of the earliest successful cycle manufactures in Birmingham and continued making bicycles into the 1950s. 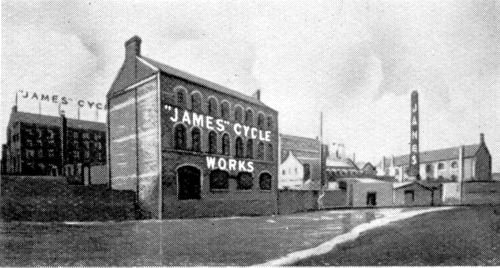 Henry James first appears in the trades directory as a bicycle manufacturer around 1883-84 occupying premises at the rear of 121 Constitution Hill, a former bed making works. Later on the premises are shown occupied by one, Harold James, before the move to Sampson Road. 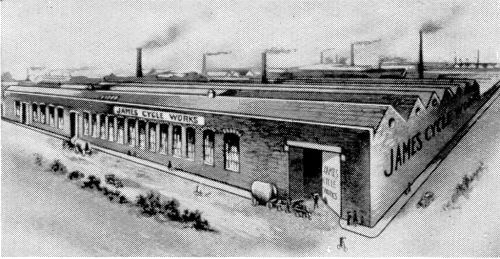 On May 22nd 1897 the company was incorporated, becoming the James Cycle Company Limited. It is believed that the company at this stage moved to Sampson Road North. Harold James retired from the company at its incorporation. 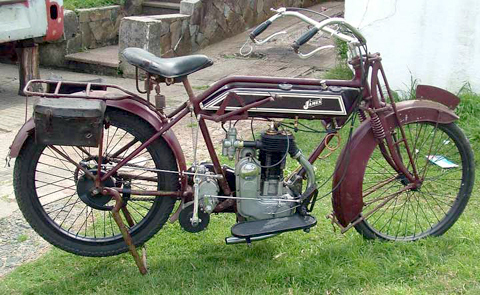 The first James motorcycle, which was designed by Frederick Kimberley was produced in 1900 and motorcycle production continued until 1904 and then was suspended, recommencing again in 1908. The company moved to much enlarged works in Greet in 1907. In 1911 James pioneered and introduced the all enclosed chain drive with countershaft gear. During the First World War, James produced over 600 motorcycles for both the Belgian and Russian armies as well as supplying military pedal cycles for the British and Allied governments. James also still specialised in bicycles, tricycles, tandems and in later on in specially designed tradesmen carrier bicycles. In 1930 James took over Frank E. Baker Motorcycles Ltd of Alvechurch Road, Northfield, Birmingham. During The second World War the company was again pressed into war service, making 2600 lightweight military motorcycles. Additionally, two stroke autocycles were also made for the Allied Forces. The works, which occupied half of Tomey Road, was badly damaged by an air raid in November 1940. Full production was not able to be resumed until 1943. The manufacture of lightweight motorcycles during the war and possibly the air raid damage, seems to have changed the post war direction of the company, as they never produced a four stroke motorcycle again. Also post war production was changed to exclusively lightweight motorcycles. James experienced financial difficulties in the early fifties and were taken over by Associated Motorcycles Ltd. (AMC) in 1951. Unfortunately for James, the AMC style of management was not to be its saviour. In 1956 AMC made the key move that would be the start of the 10 year end for James. Unhappy about the supply of two stroke engines from Villiers and feeling that their engines could be improved upon, they decided to make their own engines which were designed by the Italian, Vincent Piatti. They spent three enormously expensive years developing the engines but they proved to be so troublesome that Villiers had to be employed to rectify them! It was typical of AMC management! On August 4th 1966 the end came for AMC and the James and Francis Barnett names disappeared for ever. The James factory survives in Tomey and Gough Road, Greet. This wonderful catalogue does much more than illustrate the models of its year. It takes us on a journey through James Cycle Co Ltd, to give us a feel for bicycles of an era that, within one year, would effectively be over. I’ve not reproduced the model range in full, only the three Mercury models on offer.